Three years ago, Thailand’s National Statistical Office revealed that the number of Thais above the age of 15 who smoked cigarettes had risen to 11.4 million in the previous year – an increase of 21 percent. It also revealed that every year there were about 50,000 Thais who died as a result of smoking. Despite the staggering number of deaths, Thailand will not be increasing its cigarette tax hike. At least not until October 2021, according to the Thailand Tobacco Monopoly (TTM). TTM managing director Daonoi Suttiniphapunt explained that the country’s finance ministry had informally agreed with the plan to postpone raising the excise tax. An increase which was planned for 2019. 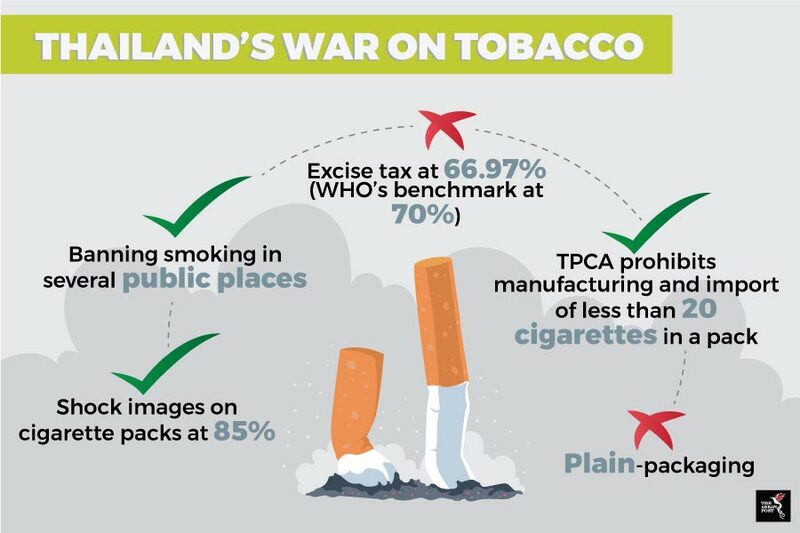 This is unfortunate because on the surface statistics show that increasing the excise duty had actually worked in favour of getting Thai smokers to either kick the habit or cut down. TTM itself admitted that sales fell sharply to 30 billion cigarettes from 42 billion only a year after the excise tax structure was revamped last September. The World Health Organisation’s (WHO) current benchmark is that a minimum of 70 percent excise tax be charged on the retail price of cigarettes. According to the American Cancer Society’s and Vital Strategies’ Tobacco Atlas, Thailand is nearing that number at 66.9 percent but postponing the next hike also means delaying meeting the WHO’s standards. Most Thais already know that cigarettes aren’t just killing smokers. In May, Action on Smoking and Health Foundation head Prakit Vathesatogkit estimated that about 17.3 million Thais are victims of second-hand smoking at home, saying that prolonged daily exposure of 30 minutes imposed a greater risk of cardiovascular problems and strokes. Citing a 2017 report from the National Statistics Office, Prakit said the risk of second-hand smokers developing coronary heart disease rose by 30 percent and their risk of stroke doubled. “Many victims inhale second-hand cigarette smoke from nearby people at offices and especially at home. Although smoking isn’t illegal, smokers should be aware of the harm caused to others and try to quit. It you cannot kick the habit, at least you should not smoke in the house,” Prakit said. Thailand, however, has not been sitting on its hands when it comes to the war on tobacco. Among the measures Thailand has taken include banning smoking at numerous places such as healthcare facilities, educational facilities, universities, government facilities, indoor offices, restaurants, pubs and bars, and public transportation. In February, Thailand took another step in the right direction by banning smoking on popular tourist beaches. Although Thailand has not implemented plain-packaging, the country has been leading the Association of Southeast Asian Nations (ASEAN) since 2014 when it comes to the size of shock-pictures and health warning statements covering the packaging of cigarettes; covering about 85 percent of the cigarette box. Other ASEAN nations that come close are Brunei, Lao PDR and Myanmar at about 75 percent. Thailand’s new regulation on tobacco which came into effect in July 2017 – the Thai Tobacco Product Control Act (TPCA) – also prohibits the manufacturing and import of cigarettes in a pack or other containers of less than 20 cigarettes. Unfortunately, the smoking-related death rate in Thailand is still worrying. Tobacco Atlas states that as of 2016, 23 percent or more men die in Thailand than on average in high Human Development Index (HDI) countries. In comparison, Brunei stands at 16 percent in high-HDI countries, Lao PDR stands at 18 percent in medium-HDI countries, and Myanmar stands at 22 percent in medium-HDI countries. So, if scary images on cigarette packaging and banning people from smoking in public areas isn’t working, what then is the solution? Among measures that Thailand can look to implement is the adoption of plain-packaging; which has proven to be a successful deterrent to smoking in some countries. In 2016, the WHO released a report stating that the period after Australia implemented plain packaging (between December 2012 and September 2015) there was an additional 0.5 percent drop in smoking. Citing Australian statistics, the report said this meant that more than 108,000 people quit, did not relapse and did not start to smoke during that period. Still, in order to address the high number of smoking-related deaths in Thailand, it is more than likely that a holistic approach will have to be taken as opposed to any one single strategy.